A high level of environmental protection, leading to a clean and healthy water environment. The ‘precautionary principle’ and the ‘polluter pays’ principle. Taking preventative action against pollution and controlling pollution at source. Taking account of the costs and benefits involved within a fair water pricing policy. Ensuring that wide and active consultation takes place during the development of water management plans. The need for international collaboration for certain river basins (e.g. Northern Ireland and Ireland). The result was the Water Framework Directive (WFD), which was adopted into UK law in 2003. Click here for more information on the WFD. The Government’s Catchment-Based Approach to the WFD was announced on World Water Day, 22 March 2011. It was seen as the tool by which Integrated Catchment Management could be delivered. One of the fundamental ideas was to engage stakeholders via a more local catchment-based approach. On the 3rd June 2013 Defra announced funding for a new framework to encourage the wider adoption of an integrated Catchment Based Approach (CaBA) to improving the quality of our water environment catchment partnership scheme for the management of the water environment, to follow on from a number of pilot projects. Administered by the Environment Agency, invitations were requested from organisations for funding to host one of some 80 catchments across England. FWR successfully bid to continue as the host of the South Chilterns Partnership, and are now hosting the current scheme entitled 'The Water Environment Improvement Fund' that runs until March 2017. In addition, FWR are more than match-funding the partnership over the same time period. The project criteria identified by Defra involves engaging with stakeholders, exploring with them and agreeing the water quality and related issues in the catchment, defining what actions need to be taken to address the issues, and identifying whether stakeholders have the capability or capacity to deliver those actions to achieve Water Framework Directive objectives. As host, it was up to FWR to identify and engage with these stakeholders, develop a shared understanding of issues in the catchment, help initiate joint agreed actions and source funding to undertake identified projects. This is an ongoing project feeding into implementation of the Environment Agency's River Basin Management Plans for the second cycle of the Water Framework Directive that started in 2015. The South Chilterns Catchment Partnership area covers 13 catchments, the major ones being the River Pang, Lower Middle Thames and the River Wye. Water bodies are classified according to a Classification Hierarchy where both Surface and Groundwater are assessed against a number of elements. In the case of Surface Waters the status is measured against two components - Ecological and Chemical. For Groundwaters, objectives are set for quantitative and chemical status. Each element is assigned a Status ranging from High to Poor though for Groundwaters it is either Good or Poor. A “one-out-all-out” rule is applied so if a water body has High ecological status, and Good chemical status the assessment given is a Good overall status. 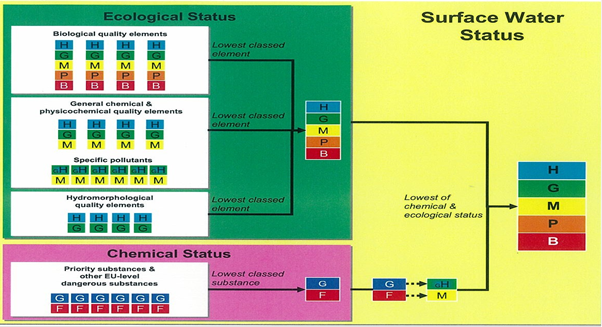 The table below describes the classification system for Surface Water.